Airedale Terriers are independent and territorial. They make good watchdogs and are knows as 'king of Terriers' Airedales are energetic and excel at hunting. They make good watchdogs because they are initially suspicious of strangers. The Airedale Terrier makes a good watchdog. The Airedale Terrier originated in Britain. Male Airedale Terriers range from 23 inches to 24 inches. Female Airedale Terriers range from 22 inches to 23 inches. Male Airedale Terriers range from 40 to 50 pounds. Female Airedale Terriers range from 40 to 45 pounds. Airedale Terriers are typically black or tan and may have some red and white markings. Airedale Terriers have a non-shedding-double coat with a wiry outer coat and a soft undercoat. Grooming requirements include "hand-stripping," which means pulling out dead hair by hand. Trimming hair between the pads of the feet is also necessary. The Airedale Terrier is an independent, territorial dog breed. Initially suspicious of strangers, the Airedale Terrier makes a good watchdog. The Airedale Terrier is susceptible to hip dysplasia, eye problems and skin infections. The expected life span of the Airedale Terrier is 10-13 years. Airedale Terriers do best in a house with a fenced yard. The owner of this dog breed should be an active leader because the Airedale Terrier may become destructive if not given sufficient amounts of exercise. The Airedale Terrier is in the Terrier group. Although the Airedale is much larger than most of the terrier group, he shares their high activity level and need for attention. In fact, one Airedale fancier describes the breed as a "Robin Williams kind of dog: a comedian prone to anything-for-a-laugh antics." Seen from the side, an Airedale is pretty much square, with height approximately equal to length at about 23 inches for the male and 20 inches for the female. Most Airedales weigh between 45 and 60 pounds. Their coat has two layers, a soft undercoat with hard, wiry hair making up the top coat. Ungroomed, the coat will become thick and unruly, making the Airedale take on the appearance of a woolly bear. Grooming may involve keeping the coat short or hand-stripping the coat, as is done for show dogs. No matter how good your grooming routine, expect your Airedale to bring the outdoors inside your home, as the coat will snag burrs, leaves, mud, and anything else as the dog galumphs through underbrush. The good thing about the Airedale coat is that there is very little shedding. There is only one allowable color pattern for an Airedale: tan with a black saddle, possibly with a small patch of white on the chest. The eyes are small and dark, shaped somewhat like an almond. The tail is typically docked, removing about one-third of the natural tail when the puppy is three days old. Done correctly, docking will leave the tip of an Airedale's tail level with his head. This regal breed originated in the Aire River Valley of Yorkshire, England in the mid-19th century, possibly as a result of crossing the English Black-and-Tan Terriers and the Otterhound. Their original purpose was to hunt river rats, a local farming sport. Early fanciers soon found the dog was equally at home on land as on the water, and could retrieve fowl and rabbits. The Airedale was imported to the United States from the United Kingdom in the late 1800's and early 1900's, with the Airedale Terrier Club of America forming in 1900. These dogs were popular in the west for their skill in hunting bear and bobcats, and in the south for their prowess in hunting wild hogs. During World War I, Airedales made their mark by serving as guard dogs and messengers, and by 1920, they had become the most popular breed registered with the American Kennel Club. This popularity was no doubt helped by the canine resident of Warren Harding's White House: Laddie Boy, a beautiful Airedale. By the beginning of the Great Depression, the Airedale had been over-bred by irresponsible individuals out to make a quick buck, and the breed's popularity waned. Airedales currently rank somewhere between 50 and 60 on the AKC breed rankings. 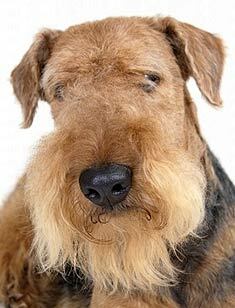 The Airedale is most commonly used as a family companion today, although they have been used in search and rescue, as well as in agility and obedience competitions. Probably the single most distinguishing characteristic of the Airedale is his personality. As puppies, Airedales have limitless energy, and can become destructive if they don't receive enough attention from their families. Their prodigious digging may leave your backyard looking as if you have a family of gophers in residence. And be prepared to deal with exuberant barking whenever your Airedale sees something in motion. After about two years, your Airedale may begin to slow down...at least a little. However, he will still insist on having your full attention all the time. In case you might be wondering, by this time, the dog will be the ruler of your home, supervising any and all projects you undertake. One of the breed's favorite tricks is to get a drink of water, which means his beard will have more water in it than his stomach does, and give big sloppy kisses to everyone who has the misfortune to be nearby. A fellow goes to the edge of a cliff and asks a Lab to jump off. The Lab says, "OK " and then jumps. Then the same fellow asks a Dalmation to jump over the edge of the cliff, and the Dalmation says, "OK" and jumps, too. Several other popular breeds are then asked with the same response. Jump. Jump. Jump..... Then the fellow asks an Airedale to jump from the same cliff, to which the Airedale responds, "You first." Airedales who are not properly socialized or who do not receive their "fair" (meaning excessive) share of attention can become destructive and aggressive toward other animals and even toward people. Care must be taken to make the Airedale a part of your family, not just a permanent resident of your back yard, if you hope to end up with a dog who lives up to his full potential as a loyal, protective, and comical companion. When I worked with Shepherds, you tell them to sit, they sit because you told them to. You want me to sit? Why? Is it necessary that I sit now (temporal analysis)? What is it about my sitting that pleases you (psychological analysis)? Do I have to sit in that space (spatial analysis). I don't think it looks nearly as good a place as this one over here (landscape analysis). Besides, I really would prefer to stand or lie down. Sitting, hmmmm. Yes, well, let's discuss the intrinsic value of the sit. To sit or not to sit, that is the question. Whether 'tis nobler in the mind to suffer the slings and arrows of sitting...that is, is it better to sit and not get corrected (or get a treat) than to not sit and get corrected (or not get a treat). Besides I cannot live by sit alone. However, if we analyze this on the basis of Kant's universal principle: 'an action can be called right if it can coexist with everyone's freedom in accordance with a universal law...' I would have to say that sitting probably can't coexist with *everyone's* freedom. It certainly is a violation of my Airedale freedom. What are you, a specist? By the way, I forgot the command. Would you repeat it again, please? 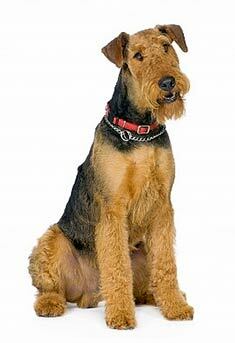 You can expect your Airedale to live about 12 - 14 years, comparable to many breeds of medium size. Depending on the breeding bloodline, Airedales may have problems with hip dysplasia and skin allergies. Before you purchase an Airedale, make sure his parents have been screened and certified by the PennHIP program or the Orthopedic Foundation for Animals as being free from hip problems. Airedale Terriers may also be afflicted by bloat, or a turning and blockage of the stomach. If your dog has stomach pain, increased salivation, and an inability to vomit even though he is trying to do so, it is a veterinary emergency. Untreated, bloat can be fatal. To prevent bloat, try to keep your dog from being too vigorous immediately after eating. Ever wonder where The Duke, John Wayne got his nickname? His birth name was Marion Robert Morrison, and he was rarely seen as a child without his Airedale, "Big Duke." Neighbors often called him "Little Duke", which he preferred to Marion, and the nickname stuck with him. Is the Airedale the right breed for you? If you are looking for a breed to match your own high energy level and to accompany you on your daily runs and hikes, you may have met your dream dog in the Airedale. However, if you live a more sedentary lifestyle, you'll want to look elsewhere. The Nebraska Airedale Terrier Associate has come up with a survey to help you gauge how your lifestyle might fit with that of an Airedale. You can find your "Airedale Quotient" on the group's website. Many Airedales end up in shelters simply because the families that bought them didn't know what to expect. Please don't be one of these families. Do your homework before you make your purchase. Find Airedale Terrier Puppies with our Free Breeder search!